“Gorgeous, heartbreaking, and ultimately life-affirming.” —Nicola Yoon, #1 New York Times bestselling author of Everything, Everything. 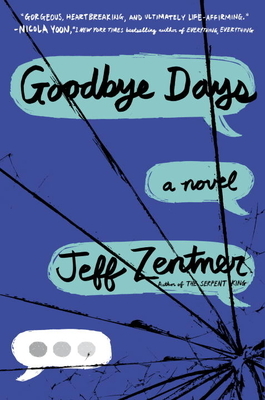 Perfect for fans of Turtles All the Way Down,Thirteen Reasons Why, and Zentner's own The Serpent King, one of the most highly acclaimed YA novels of 2016, Goodbye Days asks what you would do if you could spend one last day with someone you lost. Jeff Zentner is the acclaimed author of The Serpent King. In addition to writing, he is also a singer-songwriter and guitarist who has recorded with Iggy Pop, Nick Cave, and Debbie Harry. Goodbye Days is his love letter to the city of Nashville and the talented people who populate it. He lives in Nashville with his wife and son. You can follow him on Facebook, on Instagram, and on Twitter at @jeffzentner.